Announcement Handcrafted Leather props, costumes, artwork, and gaming accessories, inspired by steampunk, video games, trading card games, and other such nerdy interests. We craft armor, props, cosplay accessories, steampunk garb, and all sorts of gaming accessories such as playmats and deck boxes and even bags! We even do complete cosplay and character creation for all your steampunk needs. All our items are designed to be of the highest quality and made as authentic as possible. Almost everything in the shop is made to order, and made by hand. As such, please expect a few days for production, depending on the complexity of the item. We also encourage custom orders and regularly attend comic, anime, steampunk, and other conventions, as well as post coupon codes on our facebook page. Handcrafted Leather props, costumes, artwork, and gaming accessories, inspired by steampunk, video games, trading card games, and other such nerdy interests. Excellent custom made wrist cuff!! Just send him a picture and he will make it into an incredible cuff!! Extremely fast shipping! One great flask holder from Hyrule. Excellent customer service!! Great quality leather and the craftsmanship is great! Fits excellent and is breaking in quite nicely! Bought as a bday present for our son and the seller went above and beyond to make sure we had in time! THANKS! I'm running my first ever sale in my shop to bolster support for my wife's 30th birthday. Take advantage of this sale quickly, as it only lasts a couple of weeks! Sin City Wallet just completed! Message me to get a commission started today! If you're wanting something before Christmas, October 31st is the last possible date to have a chance of getting your order on time, so make sure you get your order in ASAP! Custom leather guitar strap just added to my shop! Go check it out, favorite it, and share it with your friends! You could have the last guitar strap you'll ever need. 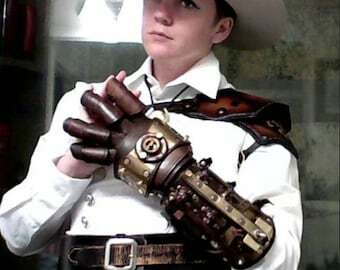 A custom gauntlet made for a member of Steampowered Giraffe. A custom gauntlet, nicknamed the Aether Injector. Here's an overview image of the shop. A custom gauntlet, nicknamed Here Comes the Boom! I've never sewn before. I didn't take home economics. My mother sews, but only on occasion, and I can remember no time in my life where anyone really made anything significant using a sewing machine. I am however, adventurous and had a little money to throw around, so I decided to go to Walmart and purchase a really cheap Brother sewing machine for around $85. I did myself a little research on how to use the machine and pattern making. After a solid week, I had hand crafted a custom underbust corset, using a pattern I had made myself, made of cheap upholstery leather. It was lined with duck cloth and was fully boned using steel bones. I used eyelets in the front and back adjustable and tied it together with some gold cord. Success! The corset looked amazing. I spent the next few weeks working on a set of foam board wings. I made myself a stencil and cut out 4 pieces of foam board with cogs, gears, and sprockets to make 2 wings. Each wing was 2 pieces of foam board with a piece of sheer cloth glued in between them, with bias tape glued around the outside edges. I had made clockwork wings, complete with a music box style key. In the end, her costume was a hit. It took a few weeks to make, but didn't really cost all that much. The leather I used was really poor quality, but worked great for that project. It caused me great frustration however. I wanted to make things of much higher quality and durability. This is when I found Tandy Leather Factory. I went and purchased some vegetable tanned leather and a couple of small tools, went home, and started crafting. After just a month, I had made my first gauntlet, followed a month or so later by my first heavy leather corset. This whole thing has steamrolled into the shop I have today. I make things I enjoy making, and sell them to those that want them. I take the most difficult and intricate commissions in order to push myself to learn new things. Today, I do this as an extremely overactive hobby and love it wholeheartedly. I love making things that people can enjoy and use. I am constantly doing everything I can to push myself and my artwork to the next level. My name is John and I am a steampunk leatherworking engineering artist. This is me and my hobby. I do this for the love of making interesting pieces of artwork that hopefully other's enjoy. This company produces custom items - tshirts, leggings, posters, etc., and dropships them directly to customers.